GameStop (NYSE:GME) will report earnings next week, and investor sentiment is the basement. Wall Street is expecting a year-over-year decline in both revenue and earnings, and investors have bailed on GameStop stock following the end of buyout rumors. But this bearish setup could have bullish implications for GME options traders. By the numbers, analysts are projecting 46% decline in earnings to just 8 cents per share. Revenue is expected to slide 4.4% year-over-year to $1.61 billion. GameStop has struggled with slow video game and console sales this year, despite an overall buying trend among retail stocks. That said, Best Buy’s (NYSE:BBY) recent quarterly report offers up hope for GME stock bulls. The big-box electronics retailer posted impressive results that were marred only by a dip in online sales. Helping boost those results was an unexpected strength in the sales of gaming consoles — GameStop’s high-margin bread and butter. Additionally, GameStop could also benefit from a rising trend in pop culture toys. The company has shifted part of its in-store inventory to figurines and other pop culture collectibles to offset declining video game sales. Among those are Funko’s (NASDAQ:FNKO) extremely popular Pop Vinyl figures and bobbleheads, which drove Funko’s revenue and earnings to beat expectations by a mile this past quarter. Click to Enlarge So, GameStop has two trends that could drive better-than-expected earnings on the quarter: video game sales and pop culture collectibles. This upside potential makes GME stock a considerable value right now. The GME stock price was hammered this past week when investors finally gave up on buyout rumors. In fact, GameStop stock has shed more than 21% from its Aug. 22 peak near $17.27. The stock has pulled back to long-term support near $13.50 and pulled its 14-day relative-strength index to near oversold levels. The only caveat here is that GME’s 50-day and 200-day moving averages are poised for a technical formation called a “death cross.” These death crosses can signal additional selling, but can be a byproduct of selling that has already taken place. I believe the latter is true in GME’s case considering the evaporation of buyout speculation. Next week’s earnings should set the record straight. How much of a move can we expect? September options are pricing in a potential move of more than 14.5%. This places the upper bound at nearly $15.50, while the lower bound lies at about $11.50. Call Spread: On the one hand, traders looking to capitalize on better-than-expected earnings and a GME rally might want to consider a September $14/$14.50 bull call spread. At last check, this spread was offered at 13 cents, or $13 per pair of contracts. Breakeven lies at $14.13, while a maximum profit of 37 cents, or $37 per pair of contracts, is possible if GME closes at or above $14.50 when September options expire. Put Buy: On the other hand, there is the very real possibility that Best Buy is hogging all the video game traffic in the brick-and-mortar retail space right now. If so, this has bad implications for GME stock. Traders wanting to side with the bears will want to consider a buying a September $13 put. At last check, this put was offered at 80 cents, or $80 per contract. Breakeven lies at $12.20, while a double can be had if the GME stock price drops to about $11 ahead of September expiration. 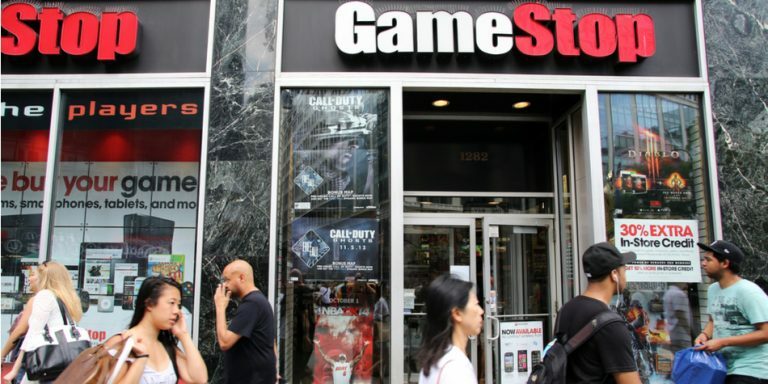 Article printed from InvestorPlace Media, https://investorplace.com/2018/08/gamestop-stock-bulls-look-to-earnings-for-an-extra-life/.